I don't know about anyone else, but I suspect many a viewing audience member, to say nothing of the studio audience, felt appalled by the display of ad hominem attacks in Sunday's presidential debate. There was some discussion of policy issues, but the ninety minutes felt like watching a domestic argument, a dysfunctional argument, and to say the least not a presidential debate. 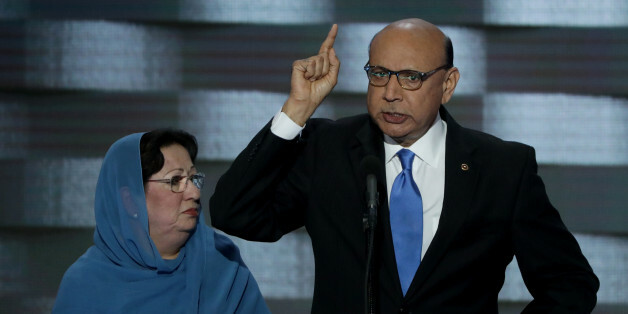 Humayun Khan was an American hero, but his story is not an exception to a rule. His family's story is far more representative of Muslim American aspirations than the phantasmagorical stereotypes so often used to portray Muslims. Two bookending clashes between the Obama administration and conservatives over bathroom and facilities access made the week just ended a momentous one for transgender Americans. Current Politics and the "McCrory"
North Carolina's governor Pat McCrory has repeatedly used a form of political dishonesty that lacks a well-recognized label. Lacking such a label, this tactic often goes unnoticed and unaddressed. To remedy this, I suggest a precise and well-earned label: a "McCrory." The problem is not memory, it is its hijacking by those who use it in a tendentious way that seeks to sustain hatred and conflict rather than foster cooperation and coexistence and by those who lack compassion and empathy. I am deeply concerned about our country's ability to attract new and fresh talent, whom I believe may be the only ones who can rescue our nation from the political cynicism and malaise, and heal the political scars and deep divisions. Possibly the current crisis has had the effect of motivating some to do exactly that. The American military is an unceasing hemorrhage of cash and aggression, committed -- perhaps only at the unconscious level -- to nothing more than its own perpetuation, which is to say, endless war. Terrorism has grown exponentially, all thanks to our efforts, while the military-industrial politicians of America still call for more of the same, more bombs, more drone strikes, more killing of insurgents -- some force has to emerge that can seriously challenge the war consensus. As one of the first people to be blamed for 9/11 by a politician, I have some thoughts on the implications of Donald Trump playing the same blame game to fuel his presidential ambitions. Blaming Bush for the attacks may play well in the media and appeal to some in the public, but it's not leadership. Today we still live in a society that attempts to define and perpetuate lies about the real lives of Jewish people and of all minoritized peoples, and even proclaims that we do not have a right to exist. But exist we do, everywhere, in all walks of life. As I assessed my friend's claim, I noticed three things about the way our society functions that I suspected might contribute to the perplexing way my friend thinks about wheat. It is not at all surprising that it is in those parts of America that conceive of moral requirements in the most harsh and absolutist terms that we find the strongest impulse to deal with those below them not with compassion but with punitive demands. Socially, we're stuck in a system of profit (private prisons, for instance) and waste (human lives). We're stuck in a society with a defective immune system, and reaping the consequences. Jews are certainly not the world's only scapegoats. It becomes a sickening reality that when political unrest occurs, the people who pay the highest price are the historical scapegoats of past conflicts. Instead of the unending beauty pageant, my colleagues could all rally around the fundamentals of healthful eating, which are in fact well-established. But I guess the allure of fame and fortune is just too great. It seems that all their "responsibility" and damnation goes in one direction. It simultaneously justifies their own hatred and actions, while assuring everyone that the victim got what they deserved. If you believe the most skeptical people (and statistics), there's a sizable population of employees out there who don't have much idea what's going on, and who get by largely by looking hectically busy and useful to others too overwhelmed to notice the deception. To stereotype and scapegoat all followers of Islam is as invalid as blaming all Christians for the despicable actions perpetrated by Timothy McVeigh, the Oklahoma City bomber who was a devout Christian. Tirades are, by their very nature, apt to gain a lot of attention and "go viral." They are dramatic. They are extreme, provocative, and full of intrigue. Hype sells. Unfortunately, much of the time -- it is wrong. We must not and cannot dismiss these incidents as simply the actions of a few individuals, for oppression exists on multiple levels in multiple forms. Manufacturing Hysteria is a political book, aimed at reminding those dedicated to civil liberties (especially the right to dissent) how fragile our freedoms are and how "close to a police state" we have come over the last century.